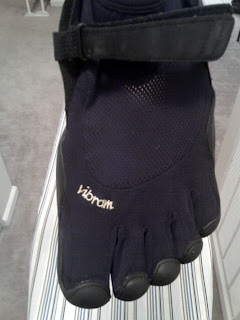 I got my hands on my first Vibram Five Fingers – KSO. w00t! 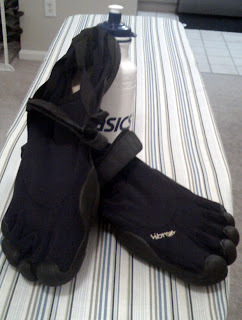 I have been eying on Vibram Five Fingers for quiet sometime and wanted one for my crazy trekking. Carrying those heavy trek boots was a pain and it gets nasty when it gets wet. Vibram Five Fingers lured me when I first stumbled upon it, especially the pictures on their website. 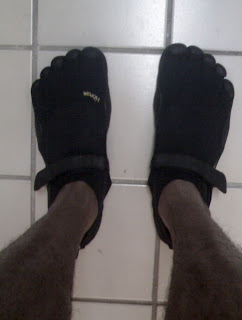 Ever since I got into running and read about the benefits of barefoot running, I wanted to give it a shot, if not for running faster at least to run with fewer injuries. I read an article (quiet lengthy but very interesting read) last year on how running shoes inhibit the natural motion of our foot and how they contribute to innumerable number of running related injuries. It also explains about heel strike and forefoot strike(Video). The article was backed up by evidences from the Sports medicine team, athletes, coach as well as real life case studies of the Tarahumara Indians who run several 100 miles every day effortless and above all BAREFOOT. There were some serious allegations against companies of the sports shoe industry. Is that why we have Adi-Zero and Nike Free now? I also had a chance to read the book “Born to Run” by Christopher McDougall. Very inspiring! I was very excited to try them but I was also aware that I have to take it slow (Read couple of warnings given by VFF users) during my first few runs as my leg would be going through a transition. Tried my VFF on a treadmill for the first time to see how they would feel and decided to run 5K. They felt really good. I could see very evidently that I started landing on my Forefoot instead of striking the heel. It felt perfect. I took them again for a 6 mile run on pavement, trail, grass and mud. I would say that it felt much better than running with my sneakers though my shin hurt a bit. I guess it comes with the territory during the first few days of using VFF but I am sure my feet will feel better in the long run. I am planning to wear it for an 8 mile race this weekend and train with them all week for my regular runs. I am hoping to run my Half Marathon and Marathon with my VFF in a couple of weeks, and if all goes will try for my 50mile too. Time to burn some serious miles!